Some kids, especially youngsters, only have the desire or stamina to ski for half a day, so what else is there for families? From horse-drawn sleigh rides and tubing down the piste, to snow caves and indoor climbing walls, these ski resorts have you covered for adventure-filled afternoons with the kids. Beyond the slopes, the mountain of choice for serious skiers has a whole host of non-ski/non-snow related activities for children and teenagers of all ages. Top of our list are the climbing walls, of which there are four; three of them located in Chamonix and one in Les Houches. The climbing wall in Les Houches has more than 100 routes for all levels of climbing and walls which are solely for children. The centre is open on weekends from 10am-10pm; opening times during the week vary. 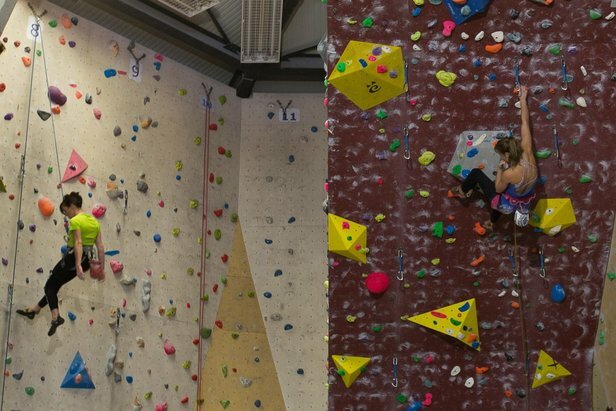 In Chamonix town, there is a good-sized bouldering wall in the Sports Centre (Centre Sportif Richard Bozon). Entry costs just 4 Euros. Requiring less effort but still packing a punch and offering incredible views is the Aguille Du Midi – the highest cable car ride in Europe. The journey to the summit, some 3842 metres above sea level, is a special one and the views over the Alps are breathtaking. There’s also bowling in Chamonix Sud or you could make like the locals and play Petanque, a form of boules which the French love, at Les Houches at the Espace Olca. For a really relaxed afternoon, head to the cinemas which show English films or have English subtitles. Chamonix's ice skating rink is also very popular with families. Family-friendly Filzmoos has a plethora of fun and exciting activities for the whole family to enjoy, from hot-air balloon rides and horse-drawn sleigh rides to tobogganing and Austrian curling. Snowbiking, a relatively new sport, is offered at three of the local ski schools. It’s quick and easy to learn and no previous experience is necessary. It’s the perfect activity when you’ve just about had enough of those skis. If travelling while lying down is more your bag, why not try snowtubing and whizz down the piste on a rubber ring. 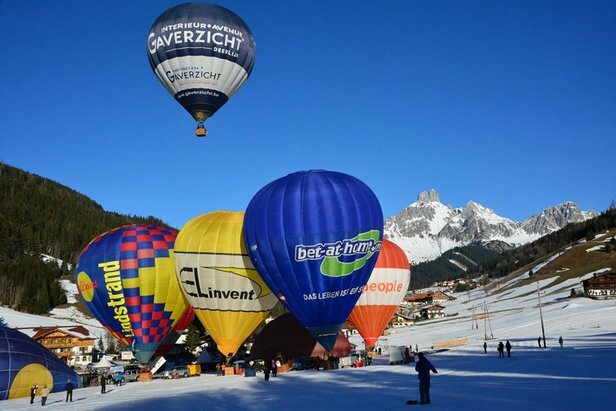 For a once-in-a-lifetime hot-air balloon ride experience, contact the Apfelwirt company, who will fly you over snow-capped mountains in perfect winter-crisp conditions. The price for a balloon ride from December to the end of February is 290 Euros per person and rides last for approximately two hours. If you’re in the resort over the second week of January don’t miss the International Hot Air Balloon Week. Every year hot-air balloon teams from all over the world compete for the coveted first place prize. Offering children’s clubs grouped by age, Les Karellis is a wonderful family resort that puts young skiers’ needs first. There are plenty of activities to partake in during the afternoons including exploring the snow cave (reconstructed each year). Or how about jumping on a segway, the resort has a variety of different routes and 10km of paths to discover, which your family can explore at its own pace. Why not head to the summit with your snowshoes on and stop off at La Vinouva altitude restaurant, then walk around the lakes and discover typical mountain hamlets. 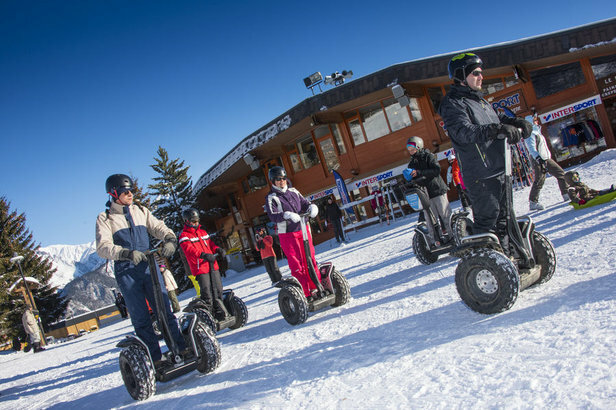 For the Segway hike, the resort’s instructors will show you how to safely operate the machine on the snow and it takes just a few minutes to learn the basics. Most of the routes start in front of Les Granges chairlift at the bottom of the resort and head towards the small mountain village of Albanne. Segway-riders follow the path and get to admire the snowy landscape while moving through the woods. Children must be at least 14 years old. For something a bit more traditional, why not rent a sledge? The sledging piste is located below the heated Vinouve chairlift. The piste is 100m long and 60m wide and is secured with nets. Fashionable yet quaint, with a rich heritage and excelling in gastronomy, for some, Megeve has it all. Add to that mix the “Famille Plus” label and you’ve got a resort that the whole brood will love. Megeve Raquettes do “Nomad Family” Snowshoeing Excursions where families can enjoy quality time together while discovering the surrounding countryside. Excursions last half a day and leave in the mornings and afternoons. A hot drink and snack are provided by a cozy log fire under a Yurt on the mountainside. Children can participate from 4 years of age. An open-air ice rink in the centre of the town is open daily from 2pm to 8pm and on Tuesdays from 2pm to 6pm, and special children’s sessions run from 6pm to 8pm. Skating costs €4.80 per adult and €3.80 per child (up to 14 years). Skate hire costs €3.20, and is free for children under 5. There's also a large heated indoor pool at La Palais Megeve. Nicknamed the Pearl of the Alps by French poet Victor Hugo and a mere 4km from Megeve is Combloux. 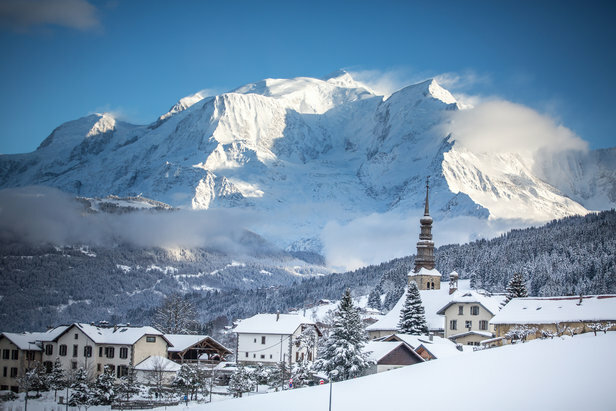 The skiing is well suited to beginner and intermediate levels and the pistes provide spectacular views of the Mont Blanc and the Aravis mountain ranges. To top it off, lift queues are practically non-existent. The charming resort, a proud owner of the “Famille Plus” label, has a ton of non-ski activities for the little ones. There’s a cordoned off sledge area in Cuchet near the ski runs which is well-kept; access is free but the area isn’t monitored so parents need to be alert. Another sledge area can be found in the centre of the village, near the town hall. Although not technically “non-ski”, Les Ecuries des Ducs introduces children to ski-joering where children ski behind well-trained ponies while directing all three paces. Ski-joering is suitable for children aged four and up. The younger ones needn’t miss out as they can take a magical pony sleigh ride. For something completely different, the local tourist office organises treasure hunts. Fancy a little night-time adventure? Then Delta Evasion offer snowmobiles at night where you can drive and discover the ski area under the stars. The resort also offers fantastic discounts on family packages. 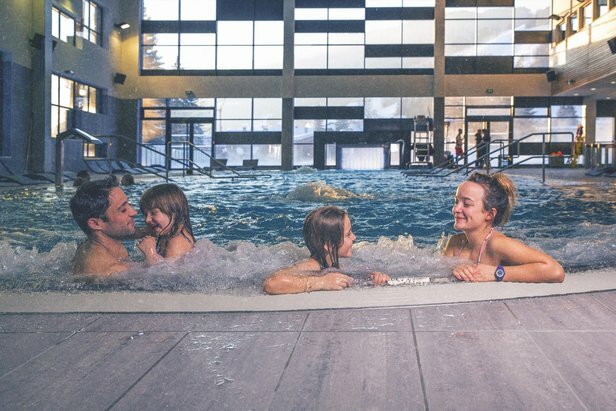 If you order at least 120 days before the start of your stay, you can get up to 40% off ski passes, ski lessons, ski rental and day care centre.